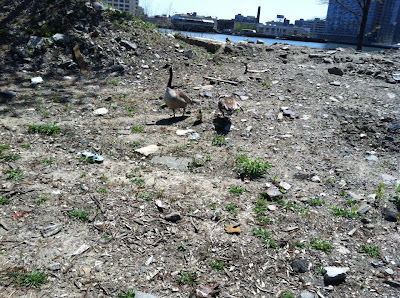 Roosevelt Islander Online: Roosevelt Island Geese Hatch New Family at FDR Four Freedoms Park - Will Geese Family Still Be At Park For June $10 Thousand Dollar Ticket Summer Garden Party Fundraiser? 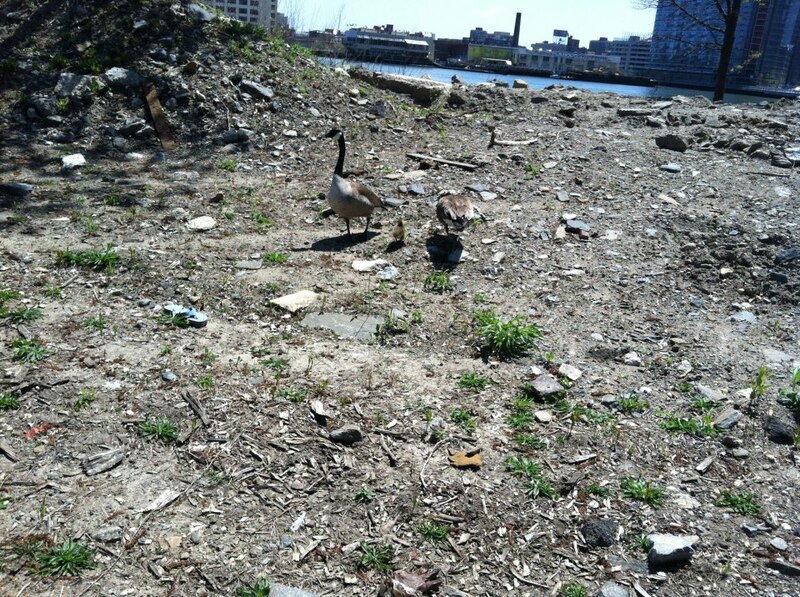 Roosevelt Island Geese Hatch New Family at FDR Four Freedoms Park - Will Geese Family Still Be At Park For June $10 Thousand Dollar Ticket Summer Garden Party Fundraiser? 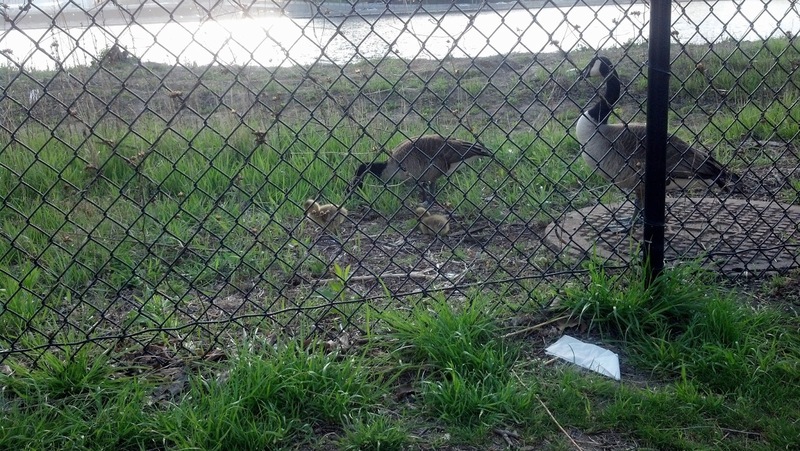 The goslings hatched! We got a few snaps of them when we were walking in Four Freedoms Park. We could not get too close because papa gosling was hissing at us mad-like. The new Resident on our Island. They are so cute! 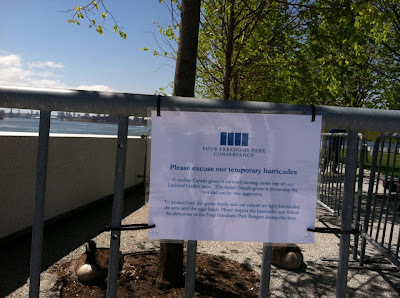 Can you believe these and the twisted priority of Four Freedoms Park Conservancy - "Please excuse our barricades" - REALLY?? What happened to Please marvel at this miracle of nature? (Look closely in the 3rd picture to see just that). Please excuse our temporary barricades. A mother Canada goose is currently nesting under one of our Littleleaf Linden Trees. The father Canada goose is protecting the nest and can be very aggressive. To protect both the goose family and our visitors we have barricaded the nest until the eggs hatch. Please respect the barricades and follow the directions of Four Freedoms Park Rangers during this time. No food and drink in the Park -- unless you buy a $250 ticket to a fundraiser. 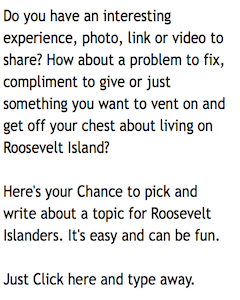 Wonder how much the Roosevelt Island Operating Corp (RIOC) will charge the FDR Park Conservancy for this event? The baby geese are so cute! Let's hope they make it! I agree with Denise - the barricade wasn't necessary. The geese can take care of themselves - if a State Parks worker is posted nearby to keep an eye on things that would have been sufficient. It's horrible they've been put "behind bars". It's touching this goose couple reclaimed the area where they used to breed on the ground before the monument was built, even though it's now covered in marble - life triumphing over the cold marmoreal monument as it were. Rightly or wrongly, I'm sure RIOC will charge FFP for the party - will come up with some kind of figure FFP will need to pay. RIOC has become the king of the angles - even trying to get money out of events that obviously benefit the island, present it in a positive light, raise the profile of the island in a positive way - thus accruing a benefit to RI that can't be measured in dollars and cents. 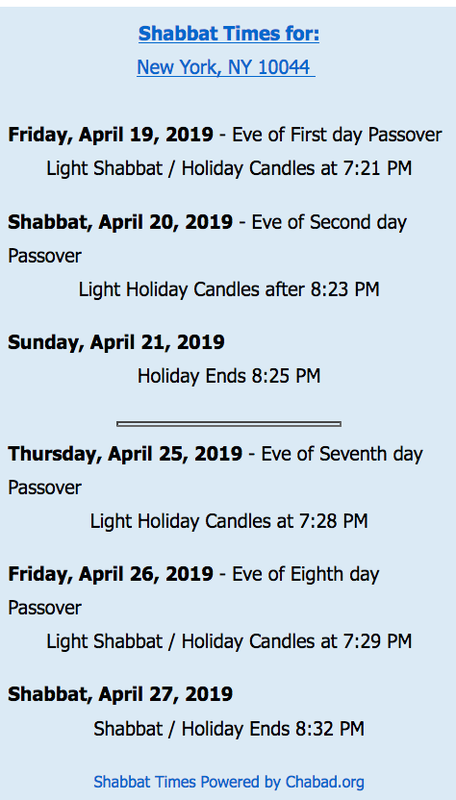 Let us hope the new RIOC President realizes the mixed message of charging excessive fees to groups that bring excellent events and the priceless gift of positive publicity/energy/buzz to RI. Hahahaha... dream on, Joe! Anyway, it's a fund-raiser! FFP can't make money on the eats/drinks it provides if it only charges $10/person. $10 wouldn't even cover the cost if they serve "quality" food and drink. CheshireKitty, I wouldn't call Octagon residents "elite", but maybe its owner is, or our RIOC Board is really dumb. As a market rate building, less than 1% of its revenue goes towards it's ground lease: Octagon pays about $4,000 a month in ground lease for services RIOC provides. When RIOC Board members (thanks David Kraut) decided to allow the Octagon developer to pay $11 million net present value, they were looking at the lump sum payment (which might seem like a lot) rather than how this would be apportioned over the 60-ish years of its ground lease ($4K/month). Mr. Kraut, no one asked the question "Gee, since we're locked into this until 2068, at 40 years from now, when (at 3% annual increases) the average apartment will be $13K/month, is $4K/month going to be the right amount of money for RIOC's services?". My hunch, based upon Mr. Kraut's mentioning it, is that he sees his contribution as Saving A Historic Building ... regardless of the long-term financial consequences to the Island. That kind of reckless financial thinking has wrecked our Island's finances (of which Mr. Kraut was involved in various transactions). This includes Southtown 1-4 (475, 465, 455, 425) which collectively pay less than $3K/month per building (even less than Octagon). So when you look at RIOC's finances (see "http://www.rioc.com/pdf/13-14ApprovedBudget.pdf", page 15, Budget Risks), who bet the farm on Southtown 7-9, you have Mr. Kramer in the excellent (for him) negotiating position of putting RIOC $69 million in the black, or $46 million in the red, with RIOC bankruptcy scheduled for 2018, 5-6 years from now. In other words, for that $115 million spread that Mr. Kramer needs to come up with, he only needs to get to $46 million to stave off RIOC's bankruptcy ... and if we were to drop H-R and re-bid the plot of land, developers know that a bid of $46 million (a savings of $69 million) is all they need to get to for RIOC to remain in the black, i.e., RIOC has waited until the end, which has weakened its negotiating stance. It's our RIOC Board that has put us in this crappy position, and they have done so for two decades. Mr. Kraut, since you've been on the board for two decades (and rightfully point to the ongoing poor oversight you've done elsewhere, like Public Safety), maybe you can explain why you've always voted for these bum deals? So who do we have next up for the RIOC Board? We have Lydia Tang who teaches math and who argues and believes the vendors at the Cherry Blossom Festival, with 10,000 visitors who were jam-packed with hour-long waits, had lost money on that event ... that's the kind of financial insight we can expect from our residents. Do attend, dear Denise, and then let us know what transpired. Probably none of the rest of us can afford the price of a ticket (or maybe couldn't stand to socialize with the FFP types). Of course the barricade is incongruous - curtailing the freedoms of these wild birds, which are of course protected by Federal law, and ironic since the monument-park commemorates the Four Freedoms/FDR. Huh? The birds can still get across those barricades. None of the animals' freedoms are taken away from them. 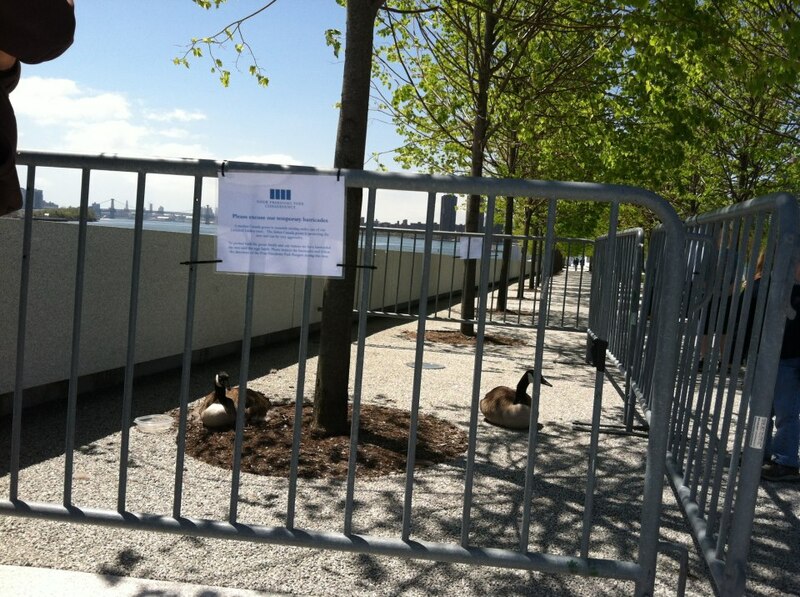 The barricades prevent some idiots to disturb the goose family and even maybe get hurt by them. Talk to your building management, have them jack up your (and everybody else's) rent, so they can rent a bus from the RIOC, too. It's in fact very difficult in this busy life to listen news on TV, so I only use internet for that purpose, and get the most recent information. as a finest site for hottest updates. 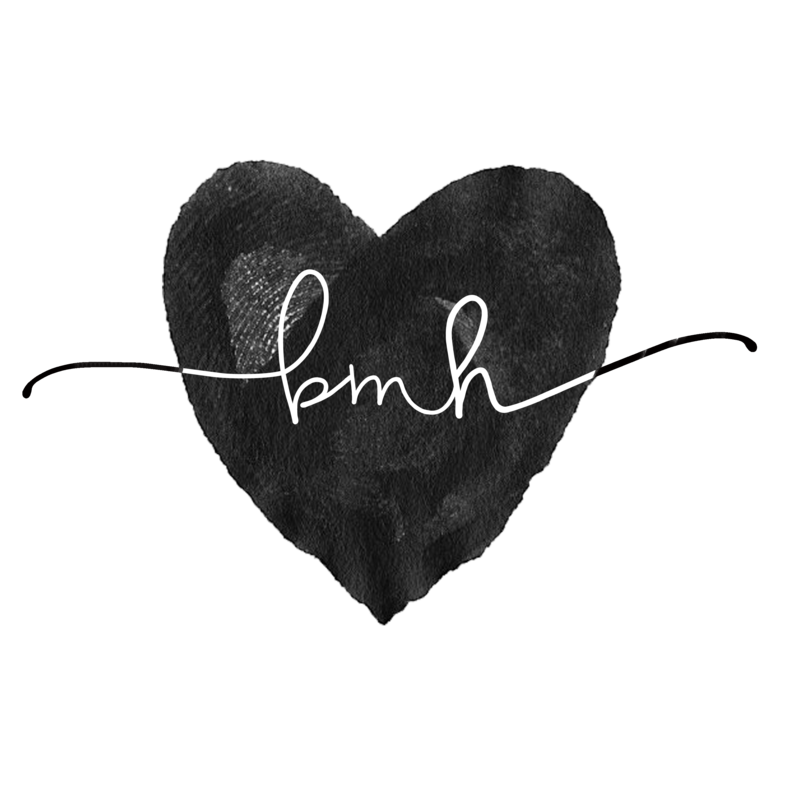 guys I've included you guys to blogroll. homework on this. And he actually bought me lunch simply because I found it for him. .. lol. So allow me to reword this.... Thanks for the meal! talk about this subject here on your web page.